Cyrus and Ibrahim Karamani, and Norallah Rabizadeh, escaped Tehran in 1997. Their families are in Israel. Meeting with families last year. Mossad has determined that three Iranian Jews – the brothers Cyrus and Ibrahim Karamani, and Norallah Rabizadeh – were murdered when they fled Tehran in 1997, as they tried to make their way to Israel, reported Ynet Monday. They were supposed to meet a smuggler who would guide them across the border to Pakistan, but never made it to the rendezvous. Last year, Mossad came to the same conclusion about eight other Jews who escaped Tehran in 1994 and were murdered en route to Israel. They left Tehran in three groups and were never seen again. The disappearances of the 11 Iranian Jews in 1994 and 1997 have been cited by the U.S. State Department as pointing to possible anti-Semitic persecution. 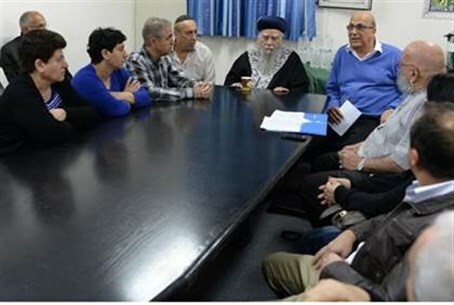 The families of the Jews had pressed the government to seek information about their fate as part of its past prisoner swaps with Iranian-backed Lebanese terror militia Hezbollah. In a statement last year, regarding the eight Jews missing from 1994, Prime Minister Binyamin Netanyahu's office said that the Mossad had investigated and "received from a reliable source, privy to the details, information that these Jews were captured and murdered while escaping (Iran)." Affirmation that the 11 are dead also has religious implications, since their wives are pronounced widows and are eligible for remarriage.